What started life as an impromptu show between six mates has become something of a drum & bass phenomenon…. When DJs Phantasy and Macky Gee and MCs Stormin, Skibadee, Harry Shotta and Shabba D got together in 2014 for a fittingly heavyweight final show at London’s now-closed Area Club, it was only meant to be a one-off. A supersized development on Skibadee and Shabba D’s longstanding SAS project but double the weight in MCs and powered two of the most respected DJs in the game; they had a good feeling it would be a popular performance and a historic way to bid the Vauxhall Venue adieu but had no idea just what would follow. 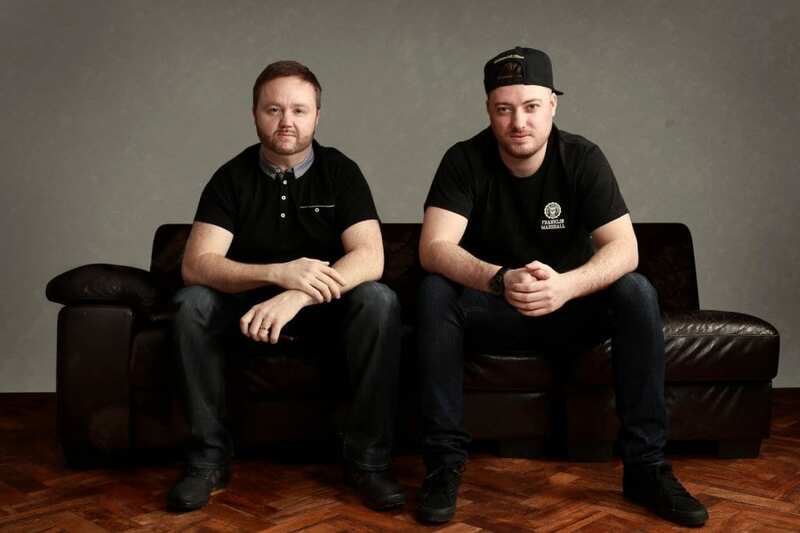 Three years and a whole stack of international showdowns later, they’ve achieved verified supergroup stripes (all while holding down successful solo careers) and become one of the most in-demand crews in drum & bass. With key shows at the likes of Rampage, Westfest, Creamfields, Let It Roll and Detonate and their own sold-out takeover tour, their explosive six-man show has been especially unavoidable this year… They’ve even hosted a rave on London bus (which was, of course, called a Drum & Bus) and are now in talks with an airline to host a rave on a plane. They’ve also developed a fine line of SASASAS leisurewear and have a fiercely loyal fan following who can spit along to ever bar from all four of the MCs. And they’ve done it all with only two single releases: Anthem and Rampage Anthem. Next month will see them build on this with a full EP. But first… An exclusive limited edition USB key crammed with a whole range of bangers from the SASASAS producer/DJs; verified OG Phantasy (who’s been involved in the game since day one) and the one and only Macky Gee. Comprising 10 of their heaviest set weapons, VIPs and instrumentals, it’s their way of clearing the vaults and preparing us for the release onslaught that is set to follow imminently. The word supergroup doesn’t come up all that often in drum & bass conversations – Bad Company and Ram Trilogy notwithstanding – but SASASAS are genuinely worthy of the title. As they prepare for their show with us at Southbeats Festival this Saturday, we caught up with them to find exactly where they’re at… And how they got here. Phantasy: Macky mentioned doing them late last year as something we should do but because SASASAS has taken off in the way it has, and because we’ve all got solo careers, it’s taken this long to get it together. Macky: And to do it properly. We weren’t going to put out any old tracks on the USBs, we had to test them in the clubs and festivals and make sure they’re the best they can be. Phantasy: We want the product to have value. Do you worry the tunes will leak online? Macky: There’s always going to be someone who shares it with their friends. I don’t think people will upload it to the download sites. Phantasy: When you pay for something why would you give it away for free? I got faith in our fans. We love our supporters – we can’t do what we do without them. Not just fans of SASASAS but drum & bass fans full stop. We wouldn’t be anywhere without them. So where’s the SASASAS productions, then? Macky: We’ve been working on a lot of tracks but haven’t got round to releasing them yet. We won’t half-heartedly make stuff and put it out. There’s a lot of love being put into the tunes. Phantasy: But there is an EP coming out hopefully in late October. Hopefully Halloween weekend. But as we’ve said, we won’t rush anything – we’d be mad to. Amen. So tell me; who came up with mad idea of a Drum & Bus? Phantasy: The promoters behind Westfest and One Nation rang me asking about some promotion ideas and I was joking saying it would be good to have a party bus going round London. A drum & bass bus, basically. The promoter, Grant, rang me the next day asking if I was serious. I said ‘well yeah if you can get a bus!’ An hour later he said ‘got one, are you free on this date?’ Just like that. It was mental. We had so much fun. Now we’re planning a rave on a plane. For reals? I read that in an interview and thought it was a joke! Phantasy: No joking. Plans are in place, things are being developed. You can’t just walk up to an airport and say ‘yo we’re going to do a party on your plane’. There’s a lot of paperwork but we’re working on it. It’s going to happen. Phantasy: Yeah I had an idea to do a night based on the four MCs. That proved to be a little difficult to sort so I spoke to all the guys and they were up for doing this set as we needed a headline set for Area, a London club that’s sadly closed, so we put SASASAS together just for that night. We had to play really late because Shotta had a few other gigs that night. It was 5.30am and the place was still heaving. I thought ‘this is weird – the crowd usually starts thinning out around 4am’ but people were sticking around to see our show. The next day we were all just inundated with messages and shouts online. Then we got a call from Grant who runs One Nation and Westfest and asked if we wanted to do the same at Westfest. That set changed everything – the anticipation for it was crazy. The beautiful thing about it was, it was organic – it wasn’t premeditated or planned, it was six mates coming together and doing this set. It’s grown organically and this year has been amazing. Doing things like Rampage and SW4 and Let It Roll. Macky: Especially things like Creamfields where there aren’t that many drum & bass acts on the line-up. Being able to show our music and show what we can do live to that type of audience has been a great opportunity. There’s a lot of energy happening in these shows. Even if you don’t know much about drum & bass, the energy transcends genre if you know what I mean. Phantasy: We just want to put a proper show on. People work all week to go out and party in the weekend. We respect that and want to party with them. People buzz of that – it’s always a two way thing. The vibe is only what you make it. There’s a lot going on in the shows too with all six of you on stage. Do you do any preparation? Macky: Before most shows me and Phantasy try and squeeze in a bit of cake making time to clear our minds and calm our nerves. Macky: Victoria sponge mostly. We also practice a little balloon modelling. Phantasy’s getting pretty good at making poodles. Phantasy: I give them to the MCs to keep them occupied while we do the hard work. Ha! Seriously though. Six of you buzzing on the stage…. That could be chaos but you guys have that perfect balance or at least seem to have it under control! Phantasy: I stand behind them with some empty water bottles – if I want their attention I fling a bottle at them so they turn around and listen for a second, haha. Macky: there is some planning of course but not a strict structure because it loses its vibe. If you plan something too much then one thing goes wrong the whole thing is thrown off. So we keep it freeform and see where the crowd want us to go. Some places prefer a neurofunk set, so if you go full HAM with jump up you’ll lose them. Phantasy: You have to read the crowd. Every rave is different. We’re not going to go in full jump up at a more commercial festival where we know not everyone in the crowd is a proper drum & bass head. At the same time we’re not going to completely change things because we’d lose the essence of what SASASAS is. You see artists becoming popular then the minute they get successful they feel they have to do something more conventional or commercial. No you don’t – stick to what you love doing because that’s what makes you popular and that’s why people come to see you. So you have to be professional and work out what the audience wants… Because it’s about them. It’s not about us. 100 amens to that. So obviously SASASAS has a big UK flavour… Is this explosion happening overseas too? Macky: Very much. For us as solo artists and as SASASAS. Austria is kicking off. Belgium is kicking off and has been for years. The whole European scene has been very healthy for drum & bass and jump-up. Phantasy: We’re talking to US promoters, too, but want to do that right and not rush in, like with everything else. But yeah we’ve also done some great shows in Australia – we had the busiest sell out show in Perth in eight years. Same in Sydney. One of the maddest gigs we had was in Kavos, Greece. The promoter booked us because were on the Creamfields line-up and didn’t even know much about us. He certainly didn’t expect it to sell out. But it did. And apparently it his only sell-out show of the summer! YES! Drum & bass is the only genre where you can play the softest soulful tune and bang a gully bassline under it and for it to work. All styles in the melting pot. DJ sets and line-ups should reflect this. Phantasy: We play everything. We don’t just go in and play one style of music. Good music is good music, right? Do you think European line-ups have had an influence on this? Macky: Maybe yeah. When we played at Rampage it’s just one big arena with every style and loads of dubstep guys too. It is a lot more mixed overseas. Sometimes the UK has been guilty of staying with one style more than other countries. Phantasy: Yeah I agree. But it is changing and it’s great that it has. Even at Creamfields we were the only drum & bass act on the stage and played between Flava D and Logan Sama. Bassline into drum & bass into grime. And the vibes were high throughout – the crowd loved it all. I don’t just listen to one genre. No one does. We all love good music. Speaking of which, what’s coming up as well as the first SASASAS EP? Phantasy: Macky’s got his Aftershock EP out now, he’s also just released a single on Friction’s label called Tour and I’m working on an EP which will drop at the start of 2018. We’re going to be in the same recording studio where Chase & Status recorded their last album and we will be getting our heads down, working on the next load of new content. We have our documentary dropping real soon and our diaries are busy. We’re already being booked for festivals next year. It’s looking really positive – for us and for drum & bass in general.